Arriving at the farmhouse in Northampton, April, Casey and Shadow settle down for some rest. April asks Casey what he wants to take back to their apartment in New York and Casey considers that it isn’t much. The two have dinner, put Shadow to bed and kiss; rekindling their old romance for a more serious relationship. Casey finds an old knife of Leo’s and April wonders where the Turtles might be. The next day, April is swimming in the lake when something under the surface pulls her down. She’s suddenly thrust into the air by Leo, Mike and Raph. The Turtles, April and Casey reunite and the TMNT are introduced to Shadow (who takes an instant liking to Mikey). The gang recounts their various adventures over the past year, though April wonders where Don is. The Turtles point to the woods and tell her that he’s with Splinter. 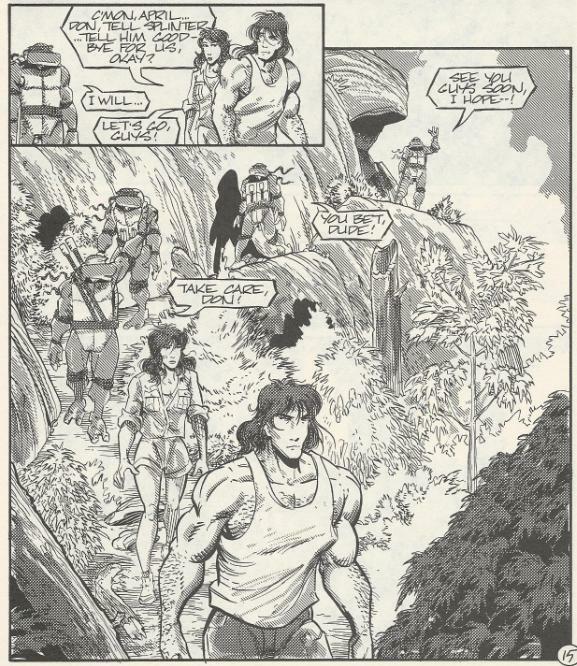 The Turtles lead April, Casey and Shadow to the cave where Splinter and Don have been staying. Leo, Mike and Raph are going to hitch a ride with Casey and April back to New York, but Don elects to stay in Northampton. His leg is still broken and he needs time to mend his wounds and reflect upon everything that’s happened. Splinter offers to stay as well and help him heal. April tells Don that he’s welcome to stay in the farmhouse instead of the cave and turns to make the same offer to Splinter. Splinter has vanished, though, and Don tells her that he has undergone a change since they last saw him. Something happened to Splinter over the last year that has left him distant. As the sun sets, everyone packs up and gets ready to go back to New York. April asks for a minute alone and walks over to the edge of the forest. She talks to the darkness in the hopes that Splinter can hear her. She says that although her biological father is dead, in the past few years that she’s known him, she has always regarded Splinter as a father, too. 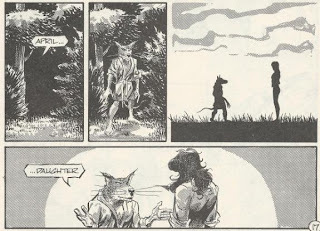 She tells Splinter that she loves him and says goodbye. As she turns to walk away, Splinter steps out of the shadows. He calls her his daughter and the two embrace. Elsewhere, Mr. Buscheyev arrives at his new apartment in an assisted living facility. Getting settled in, the old man looks out the window at the streets below and watches how life goes on. *This story is continued from TMNT (Vol. 1) #61. Though they’ll have adventures in-between, the main story continues in TMNT (Vol. 2) #1. *The letters page makes mention of the Mirage book having no plans to bring back Shadow’s biological father. Shadow’s father’s identity will be revealed in TMNT (Vol. 3) #6 (though whether that identity is canon to the Mirage continuity is up to you). A momentous issue, as the original volume of TMNT finally concludes. It really went out with a bang and, quite honestly, I don’t think any Mirage TMNT saga has ever rivaled “City at War”. Perhaps they set the bar TOO high? This was a slow and sweet epilogue that finally gets the gang back together and we can resume “business as usual”, though hopefully everyone will have learned something from their recent experiences. Though for all the changes seen in the characters after this issue, few of those alterations end up sticking. Despite now being a daddy, Casey has a few relapses in vigilante knucklehead territory until eventually taking back the hockey mask for good during Vol. 4 (and if you count Vol. 3 as canon, he gets back into his self-destructive drinking almost immediately). April disappears back into the scenery once again until Vol. 4 resorts to some desperate storytelling to try and make her interesting again. Splinter’s distant attitude never catches on and he returns to his role as zen master very quickly. 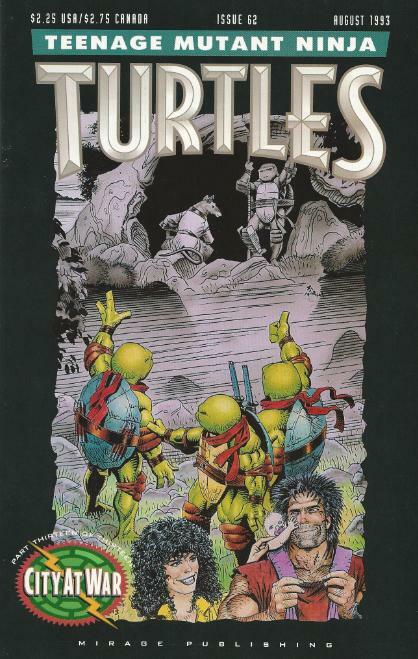 The only fallout from “City at War” that truly sticks, aside from the addition of Shadow Jones to the cast, is that the Turtles are now free to have any kind of adventure they want without the Foot Clan hanging over their heads. 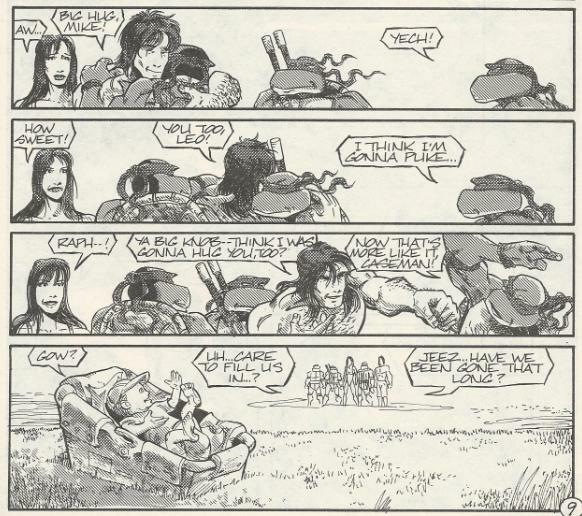 The reality, though, is that even before the truce the Turtles were having any kind of adventure they wanted and the Foot only factored in when the writers felt like bringing them back. Much remains the same, as the Turtles still have altercations with the Foot after this, though now the writers simply have to come up with contrived scenarios to momentarily break the truce for a few issues. Still, the truce stays in effect, so I guess it counts as a lasting change. I suppose I can’t really chalk that up as a failure of “City at War”. This storyline took the characters about as far as they could go and it was a challenge to the writers to try and take them even *further*. I felt Gary Carlson really pushed Raph forward during Vol. 3, but even that development was undone and rendered meaningless. In the end, everybody reverts back to who they were before “City at War” began and the characters ultimately stagnate because they’ve run out of elbow room. The shifting creative teams, early cancellations and extended periods of inactivity really take a toll on the narrative cohesion and we're constantly playing "one step forward, two steps backs". Poor sales killed Vol. 2 almost as soon as it began. Vol. 3 hung on for a while, got cancelled and then got deleted from continuity. Vol. 4 stayed on track but ultimately fulfilled none of its storylines due to Laird losing interest in the book and putting it on indefinite hiatus. Vol. 1 is the only volume of TMNT to give us a satisfactory conclusion that ties up all of its loose ends. The stories told afterward, while many of them are good, there's no longer an overarching direction to string them together; it's just the Turtles hopping from one random adventure to another. A new volume starts with a new creative team that disregards the previous, that volume gets cancelled and then another volume from another team starts and the cycle continues. After "City at War" what we get is fluctuating creative teams, character regression, false starts, early stops, prolonged hiatuses and ideas that are never afforded the time to bear fruit. Basically, following "City at War", TMNT ceases to read like an indie comic and begins to read like a Big Two superhero comic for all the reasons cited above. But when read together, Vol. 1, the Microseries and the first volume of Tales form this perfect microcosm of storytelling. There are no loose ends leftover, the story flows and the characters grow and by the conclusion of "City at War", it all comes to a natural end. For casual fans, this is a great stopping point because from here on out, you'll never again get that same feeling of natural, connected storytelling that feels like it's building toward something. I won’t say that “City at War” is the end of good storytelling in the Mirage TMNT universe, but it is sort of the end of truly ambitious storytelling. In a way, though, that actually fits one of the ultimate morals of “City at War”. The meat of the TMNT storyline is complete; their war with the Foot Clan is over. Yet “life goes on”, as it were. I've just finished the entirety of Vol 1, and after every comic I'd also read your review. You often catch things I miss and your humor and insight made this site a must for reflective reading. Thank you for making TMNT Vol 1 more enjoyable. On your recommendation, I'll likely stop reading TMNT here. I have strong nostalgia for Vol 1 since I used to get them in the mail, but I'm not much of a comic reader outside of that, so if you have recommendations for other comics that are this good or better I'd like to hear them! It just seemed odd reading your glowing reviews of each individual issue, and then later reading how you thought the guest era as a whole was a slog. By your own admission there were 16 good, great, or at least readable comics, and just 6 terrible. Perhaps you're letting those 6 color your memory of the entire era? Thank you again for the site and your work.